Q. How do you remove stains from carpet? A. It’s what made us famous. First, we’ll provide a comprehensive walkthrough to determine which method to use. Once we identify the best route to take, we’ll use our eco-friendly Green Carpet Cleaner, CB2, to spot treat stains, and then we apply a light mix of formula over the entire area of the carpet. Next, we’ll use 100 percent cotton bonnets and a rotary carpet cleaner to gently extract the soil from the fibers. Remember, most furniture removal, vacuuming and grooming can be left to us. Q. How do you remove nail polish from carpet? A. We’ve dealt with every type of stain imaginable, including nail polish stains. Our impressive cleaning solutions, professional carpet cleaning equipment and team of skilled technicians are equipped to thoroughly remove nail polish stains from your carpeting or rugs. Q. What other stains can you erase? A. If you can see it, we can probably clean it. 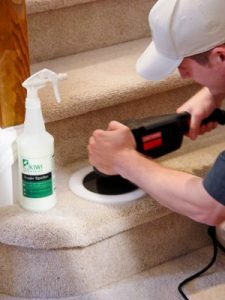 Our tough cleaners and high-tech equipment will eradicate pet stains, including feline urine, bleach stains, wine stains, wax stains, dye stains, paint stains and even ink stains. Q. How long does it take to dry? A. One of the many reasons our customers return time and time again to KIWI Services is because we offer incredibly quick carpet cleaning. Typically, our cleaners dry in about 15 minutes. That means you can get back to your busy life without having to wait around for carpets to dry. Even heavily soiled areas will dry quickly with KIWI’s methods. Q. Will you remove my furniture for me? A. We will gladly move any lightweight furniture before beginning the carpet cleaning process. With that being said, we must follow industry safety standards, so some items may be left up to you. We will not move heavy, breakable items, including china cabinets, pianos, bookcases full of books, beds, large dining tables, dressers or any electronic equipment such as TVs, VCRs, stereos or computers. Q. Do KIWI Services’ carpet cleaners leave a scent? A. Yes. Our fresh, citrus scent is popular among homeowners, even those with serious scent sensitivities. Q. Can you take care of pet stains and odors? A. Certainly. We even offer a special Pet Odor and Stain Removal Plan with multiple facets, including an antimicrobial solution that helps to target pet-related odors, an odor-eliminating injection that targets deep-penetrating odors and an incredible Subfloor Germicidal Rinse to eradicate pet scents that have seeped into the floors and padding. Q. Are your cleaners safe for my pets and family? A. Yes. Our solutions are made of natural ingredients and are free from harmful chemicals. Plus, our Green Carpet Cleaning solution, called CB2, is also designed to be easier on the planet than traditional carpet cleaners. CB2 is free from nonylphenol (NPE) and other carcinogens that are classified by the National Toxicology Program (NTP), the International Agency for Research on Cancer (IARC) or the United States Occupational Safety and Health Administration (OSHA). Additionally, CB2 is GRAS (Generally Recognized As Safe) certified by the Food and Drug Administration. Q. 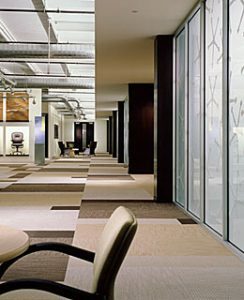 Should I use KIWI Services for my commercial carpet cleaning? A. Yes. 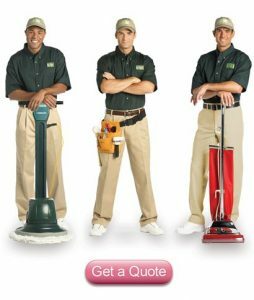 Business-owners of every sized company trust KIWI because we will clean your carpets around your business hours and schedule. KIWI Services’ commercial carpet cleaning can help save you money, because you can write off the full cost of your cleaning as a legitimate business expense on your taxes. Additionally, we’re fully licensed, bonded and insured to help businesses reduce the risk of Worker’s Compensation claims and other premiums. Q. Is there a warranty on carpet cleaning? A. Yes. We cover each and every carpet cleaning of $120 or more with our 100 Percent Clean Guarantee. That means that if you’re unhappy for any reason within 30 days of your original service, we’ll gladly return to your home and re-clean your carpets at no extra charge to you. We’ll even do you one better with our popular unlimited $4 per room warranty cleanings that come with every cleaning service of $120 or more.